UK, 1971, 88 minutes, Colour. Graham Chapman, John Cleese, Michael Palin, Eric Idle, Terry Jones, Terry Gilliam. Directed by Ian Mac Naughton. A collection of sketches from the original television series of the Mony Python Flying Circus. During the 1970s, three feature films were made: Monty Python and the Holy Grail, Jabberwocky and The Life of Brian. In 1982 they released The Meaning of Life. 1.The impact of the film? In the 1970s? 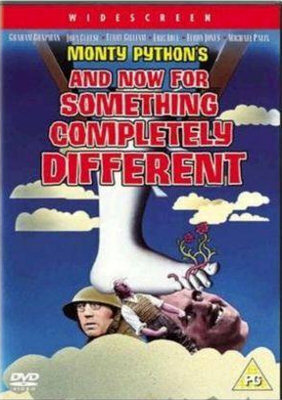 The aftermath of the introduction of Monty Python and the Flying Circus in the 1960s? The comedians themselves, the type of humour, zany, satiric? British? 2.The structure of this film, the variety of narration incidents, visualising, the stating of the title? The different Pythons presenting? The visuals of John Cleese? Graham Chapman in the military uniform? 3.A film of sketches, the type of humour, the effect? The editing and pace? The movement from one episode to another? The use of the animation? 4.Terry Gilliam’s animation, a strong presence in the film? During the credits? The visual style, ironic, black? 5.The impact of each of the Pythons and their particular style? Seen in retrospect from their subsequent careers? The hiding in the bushes sequence, the people standing up and being shot? The lesson about hiding? The tape recording up their nose comedy, the two brothers, the silent movie style? Used as an interval? London 1971, the Hungarians, the tobacconist, the language and the play with language and translation, John Cleese and his style, Terry Jones in the shop? The police taking the bike, going to court? The accusation of the maker of the book and translation? Making mischief? The animation and the variety of hands, as trees…? The man lathering his face, completely, cutting off his head? The marriage counsellor sequence, the voice of God? A counsellor, Michael Palin as the stuffy husband, the wife and her carrying on with the therapist, the husband being urged to go back in, his inability to be assertive? David, the extended hand on a spring trying to take the figleaf? The pub sequence, Eric Idle and his ‘Nudge nudge, wink wink, say no more’ routine? Terry Jones as the proper patron of the bar? The insinuations? The gym training, Terry Gilliam glimpsed as a nun rowing the boat, John Cleese and the discussion about self-defence against fresh fruit? The gangs of old ladies, the James Bond music, the social commentator on behaviour, the bikies afraid of the old ladies, the adults in nappies as an attacking gang? The army critic of the silly film? Wanting decency? The military background? The platoon and the camp dance drilling? The cancer spot, on the loose, the cat devouring the houses? The interview about mountaineering, John Cleese and his comedy, myopic, seeing two images? Facing the interviewee in the wrong way? His not knowing anything about mountaineering? Climbing all over the desk and the wall of the office? Michael Palin, the sketch of having his wallet robbed, picking up the policeman? The comedy of the flasher? The animation of the toothpaste ad and the racing cars? The animation of the face, the teeth like a keyboard but dancing? The sketch about the mice and hammering the mice? The program, It’s The Arts? Sir Edward, the interview about his films, John Cleese and his muddling things as the interviewer? The seductive woman, the milkman, going up the stairs – and the room full of milkmen? The joke writer, dying laughing? His wife dying laughing? The Pathé News, the army, the passing on of the joke through the troops? The mock joke of Hitler? The comedy of the buses, the killer cars? The animation of Botticelli’s Venus, the music and the dance? The famous parrot, dead parrot sketch? Michael Palin singing the Lumberjack Song? The restaurant, the issue of the dirty fork, the growing apologies, the exasperation – and the relief that it wasn’t a dirty knife as well? The Rodin animation, the playing of the leg as a flute? The robbery of the shop – not a bank, a lingerie shop? The executives falling past the window, the comments, the bet? The animation of the caterpillar, black and white, going to bed, emerging in colour as a butterfly? The vocational guidance, the counsellor, the man in accountancy, his suitability for the job, wanting to be a lion tamer? The blackmail, the letters and the evidence? The cumulative effect of all these sketches? A particular sense of humour? The appeal in its time? Now?